So how does Crewbay work for crew? We aim to save you time and money. For starters we’re free to post and communicate. It’s what makes us great! Our free membership has everything you need to find a boat. You'll get an advert, profile, and the ability to send messages to other members. First we need to get you signed up. Crewbay already gives you a taster of what's available by allowing you to search and view profiles. When you're signed up you'll be able to message or apply for positions. By signing up, you are telling Crewbay you're serious about becoming crew and so we will do our best to find you that position! When you sign up, Crewbay takes you through a welcome conversation asking relevant questions suited to your situation. Once complete further profile content can be added at your own leisure. Crewbay gets to work creating a beautiful advert, promoting key parts of your profile. 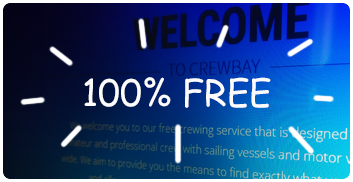 Crewbay then analyses and organises your requirements, allowing members to view your profile, putting your advert in front of the right people suited to your requirements. Pick a job type, filter the location, maybe just stick to premium members only... see what opportunities await you. Crewbay has an ever increasing multitude of recreational and professional boat opportunities, private and via agents. Everything in one space! Search professional or recreational boats. Premium - Boost your chances! All crew have the option of enhancing their profile further with premium membership. Premium allows unlimited check-ins which puts you top, allows unlimited messages, contact numbers, a URL (fb page, website etc), bigger advert with more content, unlimited photos and more! It will also unlock content within boat profiles. When you've found a few boats that suit, you can either apply (if it's a professional position) or send a message if it's a recreational position. Some boats will even offer quick contact details. Once contact is made, the rest is up to you! Good luck. Remember we are just an introductory service, please take all necessary precautions.